We've covered the new Cinnabon cupcakes quite a bit here; if you haven't tried them yet, next Thursday, April 15th, you can do so for free! 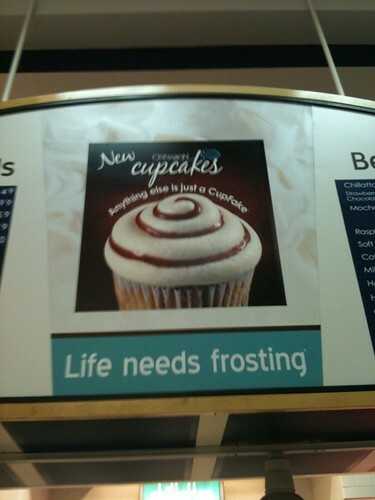 "At Cinnabon, we believe that Life Needs Frosting," said Gary Bales, Cinnabon president. "Everyone deserves to splurge every once in awhile, so we'd love to be the frosting on our Guests' day -- particularly on days as painful as Tax Day. We're also excited about featuring something new to enjoy -- Cinnabon cupcakes." As part of the promotion, Guests can enter the brand's online essay contest now through April 15th for the chance to win a $100 gift card. In 500 words or less, participants should explain why their life needs Cinnabon frosting. Visit www.cinnabon.com to enter the contest and read the official rules. *While supplies last. Limit one offer (two bite-sized cupcakes) per Guest during the day of the promotion. Counts may vary by bakery. Valid only at participating U.S. mall-based bakeries. Not valid at airports or travel plazas. No purchase necessary. No cash value.